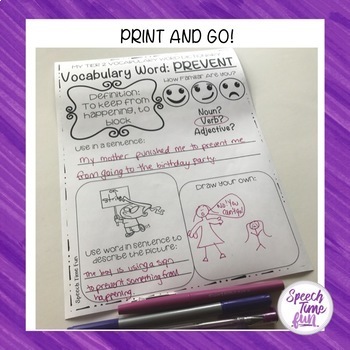 Tier 2 vocabulary encompasses words that often occur in mature language situations, so this product best targets older students and mixed groups. 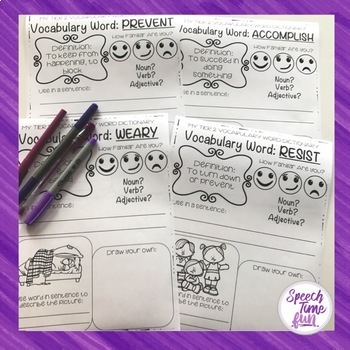 I think you'll find that your students will have a lot of fun learning vocabulary while creating their own dictionaries! What awesome resources are included? 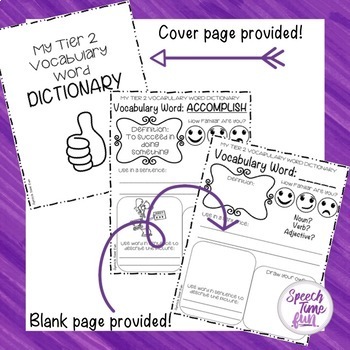 ★ Use as a stand alone activity or to preview/review tier 2 vocabulary words. ★ Appropriate for grades 3 and up. ★ Use to assess students' familiarity with words provided. ★ Words, definitions, and illustrations of words in use are provided. ★ Students can identify part of speech, use words in sentences, and illustrate use of the words as well. Want this resource for earlier grades? What are tier 2 vocabulary words? They are vocabulary words seen across content areas and commonly seen on standardized tests. Evidence shows that there is an association between vocabulary knowledge and academic attainment. (Spencer et al., 2017). What are other customers saying about this product? "Yay! This fits nearly half my caseload this year! I will enjoy using these worksheets with my older students. Thanks so much - I've loved everything I've purchased from this store. 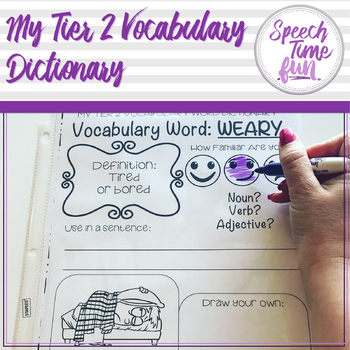 :)"
"I am always looking for new materials to teach Tier 2 vocabulary, it looks functional and engaging for upper elementary students, love the illustrations, looking forward to use it with my kids, thank you for taking time in choosing the words!" Want updates on new products added? Follow me!